I sort of took part in the Molyjam. 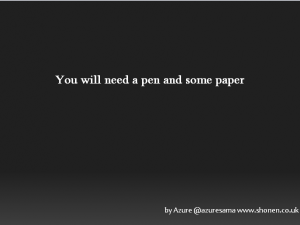 ” You will need a pen and some paper” is an interactive multimedia experience ….. In order to play you will need a pen ( or pencil) and a sheet of paper. This is a mini Moly-jam as I didn’t have a full two days to make it. Note: Due to an engine bug please play it in windowed mode at default size 🙂 Let me know what you think ( and share what you make if you choose )!